CU CHI - Enemy soldiers near the Cambodian border are practicing their own brand of escape and evasion, but they have two gauntlets to run - forces from Tropic Lightning's 3d Brigade and their own brothers-in-arms, other communist soldiers. "More and more enemy soldiers are rallying to the Government of Vietnam every day," said a 3d Brigade intelligence officer, "but they're finding it harder and harder to break free from their units to get to a Chieu Hoi Center." INTELLIGENCE AGENTS have heard that many enemy deserters are living in a section of Ba Thu, a Cambodian border town frequented by North Vietnamese Army main force units. They have congregated, waiting for the chance to slip across the border and through many traps, both friendly and enemy, to surrender under the open arms program. IF A MAN IS lucky enough to by-pass the border guards, he is likely to bump into liaison runners who immediately ask the future rallier where his unit is and why he isn't with it. "We've been led to believe that some sort of pass is required for a man to be unaccompanied near the border," officials said. "He's been pushed into the hostile, swampy regions west of the Vam Co Dong River and even the hardy Viet Cong and NVA can't survive for extended periods of time in this area. They have to come out once in awhile, and when they do they risk death." ONE TESTIMONIAL to the zeal ralliers have was discovered recently when two hoi chanhs from Hau Nghia Province were found at the Tay Ninh Chieu Hoi Center, many miles away. "They said the line was too long at the Bao Trai Chieu Hoi Center and they didn't want to wait. Obviously," an official said, "once a man sets his mind on rallying, nothing short of death can stop him." CU CHI - Men from Bravo and Charlie Companies of the Fire Brigade Golden Dragons combined forces with Stinger gunships, the Air Force and the 3d Company of the 2d Battalion, 49th ARVN Regiment recently to kill 17 Viet Cong holed up in the Ho Bo Woods. From the time Charlie Company eagle-flighted into a hot landing zone until it was picked up once again, it was an action-packed day. Many spider holes were uncovered, one containing the body of a female Viet Cong. The Bravo infantrymen swept into an adjacent area and came across a well-camouflaged and fortified bunker complex that proved to be an enemy R & R center. "There was even a makeshift picnic table," said Private First Class Mike Bartosch of Waterloo, Mich. Several Viet Cong were routed out of one spider hole given away by a freshly-cut tree stump. 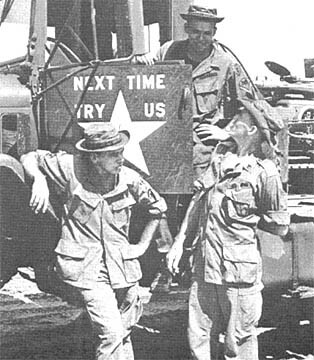 The three-company operation was an attempt to clear the area of possible enemy staging points. CU CHI - The din of a company of GIs and a squadron of armored personnel carriers was not enough to awaken an enemy sentry recently. The result of his sound sleeping habit was five NVA dead. Action started when Delta Company, 2d Battalion, 14th Infantry was sweeping an area near Cu Chi with their transportation, APC's from the 10th Armored ARVN Regiment, close at hand. The company spotted the sentry asleep in a hedgerow. He awoke and resisted capture, along with another NVA who'appeared on the scene. They were downed with small arms fire. A third NVA soldier gave himself up. Four more enemy were observed heading for cover. One of the four then gave himself up. Rockets of two Cobra gunships ended the resistance of the remaining three. In addition to the two detainees, three AK-47's were found. This was the second joint operation of Delta Company and the ARVN armor unit. CU CHI - The enemy depends on the Viet Cong Infrastructure (VCI) to provide him with food and shelter. When VCI personnel are captured or killed, it is a double victory; the fighters waiting for supplies and a place to hide are also defeated. Just such a victory happened in the Bau Dieu area when the Fire Brigade, 1st Battalion (Mechanized), 5th Infantry, the 65th Engineer Battalion, and the 132d Vietnamese Regional Forces teamed up to bring in seven detainees and total a body count of seven as well. Early that morning on a reconnaissance mission, elements of the Bobcat Alfa Company brought two detainees out of a bunker. The Mech called in the RFs, who were in the vicinity with a rome plow crew from the engineers. The combined units combed the region carefully. The detainee took the Vietnamese Forces to a hidden bunker that sheltered three VCI. Efforts to persuade the men to rally to the government were answered with hand grenades. The three enemy, one of whom was the VC chief of Phouc Hiep Village, died in their resistance. While the rome plow was busy uncovering a hole that contained two more VC, an enemy soldier threw a grenade at the dozer and wounded the driver. The Bobcat element carefully checked the site and recorded four more enemy KIA. 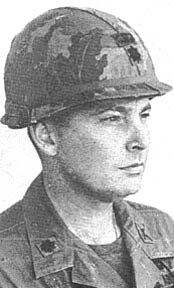 Captain Ralph Laubecker, Bobcat Intelligence Officer, said, "This victory eliminating the effectiveness of the VCI will severely cripple enemy activity in the Cu Chi district. Without the infrastructure to get food and hiding places, the Viet Cong will not be able to conduct effective operations here." 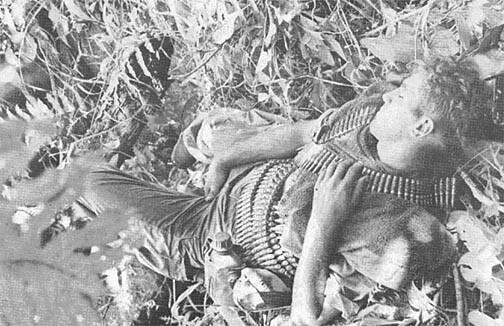 CU CHI - "You guys won't even believe what I found in this bunker," said Sergeant Severin (Skip) Erickson as he peeked out of an underground chamber. In a large bunker, he found two sewing machines set up to patch Viet Cong clothing, plus a workshop for constructing mines and boobytraps. There were also more than 200 pounds of rice, new men's and women's clothing and five pounds of medical supplies. The Golden Dragons' Bravo Company found the cache near Fire Support Base Patton II. There is a wise old saying that says if you go wandering around the perimeter at night, you're looking for trouble. The night guards are also looking for trouble and someone sneaking around in the dark is trouble. Stay away from the wire at night unless you have business there and guards know you're coming. DEROS. Do it the safe way. Staff Sergeant Jon M. Davis, a platoon sergeant with Company C, 2d Battalion, 14th Infantry, has been added to the Tropic Lightning Combat Honor Roll. During a reconnaissance mission, a man in Davis' company tripped a well-concealed booby trap, and was seriously burned by a white phosphorous grenade. Davis immediately moved to his stricken comrade, extinguishing his flaming clothing. After the man had been evacuated from the area, the unit continued on its mission, but the action wasn't over. As the company entered a thicket, contact was made with a squad of North Vietnamese Army soldiers. Davis quickly deployed his men into strategic positions and directed their fire on the aggressors. While throwing hand grenades and placing small arms fire on the hostile force's emplacements, Davis effectively kept control of his men, thwarting the enemy's attack. For 51 years, we have observed November 11th - the day the armistice was signed concluding World War I - as an occasion to honor the men and women who have served with distinction in the armed forces of the United States. It is a time when we pause to pay tribute to all veterans who have struggled - from Valley Forge to Vietnam - to defend the liberties of the American people. Those who wear the uniform of the United States have been called upon to serve far from home and loved ones to protect our birthright of freedom. Their courage, devotion to duty, and strength in the face of hardship command the respect and admiration of a grateful people. On this Veterans Day, as we honor those who have served so well, let us remember that our veterans have given Americans a chance to build toward the goal that all of us seek: peace. Richard M. Nixon On this November 11th, all citizens of our Nation will have the opportunity to honor the veterans of our Armed Forces. This is indeed an appropriate time for prayerful reflection on the contribution which they have made to our security throughout our history. America must never forget the legions of brave men and women who have served in our Armed Forces to guarantee our freedom. Their sacrifice stands as an eternal monument to the valor and dedication they have displayed in time of crisis and conflict. Selflessly they have fought against aggression to ensure our survival. This heritage of devoted service brilliantly illustrates the importance of the role which you fulfill today as members of our Armed Forces. Our Nation relies upon each of you to maintain the strength of our defense posture to protect our freedom. Melvin R. Laird Secretary of Defense Let us reflect, as we fight and work, on those Americans who served before us in defense of the freedoms which all of us hold so dear. Today, as we defend those same freedoms with our allies in the Republic of Vietnam, the American serviceman can, perhaps more than any other group of Americans, understand the significance of freedom. Our Vietnamese counterparts have demonstrated their willingness to endure enormous hardships in order to attain their freedom from communist oppression. Your achievements have made this possible and have demonstrated to the people of the world our nation's determination to defend the institutions of freedom. You have met the challenge with courage and determination and have helped to write a new chapter in the history of man's relationship to man. Wondering about your benefits under the GI Bill? QUESTION: As a veteran of Vietnam and two years active service who did not complete high school before entering the service, would I be able to finish high school at government expense? ANSWER: Yes. In fact, there is a special program set up for Vietnam veterans who have not completed high school. The financial assistance you receive to get a high school diploma will not use up any of the benefits you have earned for education after high school. QUESTION: What is the time limit of the guaranteed home loan a veteran may obtain from a lending institution, and what is the maximum time allowed to repay such a loan? ANSWER: The VA has no limit on the amount borrowed, but has a limitation on the amount of the guarantee to the lender. The guarantee may not be more than 60 per cent of the loan and in no event exceed $12,500. These loan mortages may run up to 30 years. QUESTION: Can I train for a commercial pilot's license under the GI Bill? ANSWER: Yes, if you have earned enough benefits and meet the necessary qualifications, first of which is that you possess a private license or its equivalent. Also you must meet the medical standards established for a commercial pilot and your training must be approved by the approving agency of your state. CU CHI - Three Long Range Reconnaissance Patrol (LRRP) teams from Company F, 75th Infantry Airborne Rangers joined the Fire Brigade's 2nd Battalion, 12th Infantry Warriors recently in a smashing effort to blow Charlie's mind. In a planned four-day operation, the three LRRP units were inserted just after noon at separate locations to the west of Highway 6A, near Fire Support Base Pershing. The three sites determined an area about four kilometers square. SETTING UP an ambush, one team sent out a small recon patrol that found an assortment of booby traps and trip wires. When the patrol returned to its original ambush site, it made contact with an unknown size enemy force. One NVA soldier was wounded and detained. Finding itself surrounded, the Ranger patrol initiated escape and evasion tactics and set up a hasty AP about 50 to 100 meters from the contact area. "Again we exchanged fire with the enemy, killing two in the initial burst of fire and three more a few minutes later," said Staff Sergeant Kenneth Cecil of Louisville, Ky. "We let them come to us and just hit them as they came in." WITH THEIR insertion coming right on the heels of the first team, a second group landed with the Warriors' Bravo Company. After moving only a short distance with the Warrior element, the Rangers split off to the north and east for about 1200 meters. Sergeant James Badger of Niagara Falls, N.Y., described the scene: "Shortly after we set up the ambush, we sent out a recon patrol to scout the area. We found no booby traps, but there were holes and tunnels everywhere." The small patrol returned late in the afternoon and shortly thereafter, rain began to fall. "ALMOST AS soon as the rain began," Badger added, "the enemy began firing. All we could see were muzzle flashes. I think there were about ten of them, but there was no way of telling for sure." A third Ranger team, meanwhile, was prowling its area, but couldn't scare up contact during its four day outing. The other two teams praised the support they received from Centaur and Diamondhead gunships of the 3d Squadron, 4th Cavalry and the 25th Aviation Battalion. "THEY DID A great job," Badger said. "Our support is the finest in Vietnam." After the contact had been broken, the teams were returned to Fire Support Base Pershing, having accounted for a body count of five NVA while collecting an assortment of enemy clothing, web gear and AK-47 magazines. CU CHI - It isn't often that Charlie Troop, 3d Squadron, 4th Cavalry will leave one of its mighty Sheridan tanks behind as rear security, especially on a day when it is the only tank the troop has with it. "We were on a reconnaissance-in-force mission in the Citadel area, south of the Boi Loi Woods when the troop was called upon to check out movement in a hedgerow about 200 meters to our left front. 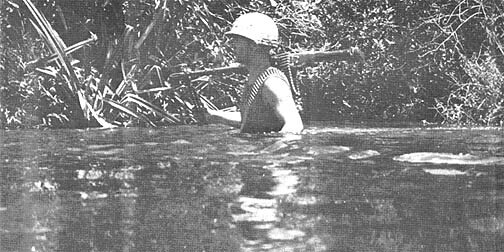 Since there were several rice paddies to cross before reaching the hedgerow, and since my tank tends to get stuck in wet rice paddies, I was instructed by my platoon leader to remain behind as a security measure." It wasn't long after the troop had passed through the first hedgerow that Lambert spotted the first VC. Private First Class Mervyn Sanders of Lansing, Mich., 17's driver, said, "He came running out of the same hedgerow the troop had just passed through, running in the opposite direction, when we opened up with M-60 machinegun fire. Not long after, another VC tried the same tactics, and he was also stopped by our fire." BAO TRAI - A Mobile Advisory Team (MAT) here has set up a Vietnamization program that trains Regional Forces to defend their outposts, use their weapons and pacify the community. The program is designed for South Vietnamese forces working with Tropic Lightning's 3d Brigade, so they can become better soldiers through advanced training. MATS are part of the Military Assistance Command, Vietnam. They usually include seven or eight men who set up small perimeters in outlying areas. One team, MAT 54, is now working with the 665th Regional Forces Company a few miles southeast of Bao Trai. In less than a month, the team has built a fortified camp, and although it's presently surrounded by rice paddies, the ramp will soon be serviced by an access road, according to First Lieutenant Heldon Jung of El Paso, Tex., the team leader. MAT 54'S method has been to give instructions while carrying out normal operations. For instance, when the team was building its base camp, RFs were on hand to assist and observe. The RFs were able to learn the proper use of barbed wire, placement of claymore mines and where to set up firing positions. Even before the camp was finished, MAT 54 was accompanying the RFs on daily combat and pacification missions. Short sweeps in the camp's vicinity are proving to be a valuable aid in upgrading the Regional Forces. From the Americans, the RFs learn proper use of artillery and air support, correct patrol formations and effective ambush techniques. ONE OF the most important phases of the operation is the combined pacification project segment. Team 54 has experienced medics who, with their Vietnamese counterparts, visit the surrounding hamlets and set up temporary clinics. They are supported by nearby military hospitals that have evacuation helicopter support. According to Sergeant First Class A.J. Taylor of Shreveport, La., one of Team 54's advisors, the program has been successful not only with the RFs but also with the local civilians. "Each afternoon, the farmers have been stopping by about three o'clock and helping fill sandbags and dig bunkers," Taylor said. "They've been very receptive." CU CHI - When three brothers are stationed in the same unit, they are bound to be both a source of confusion and a focal point of local humor. The Fosdick brothers from Oswego, N.Y. of Delta Company, 725th Maintenance Battalion are no exception. Staff Sergeant Donald R. Fosdick, 27, part of a family of nine boys and five girls, arrived in the company in June 1967. 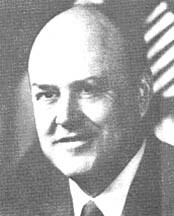 He re-enlisted for his job as the company's senior stock control supervisor in February 1968. SPECIALIST 5 Samuel R. Fosdick, 19, showed up in Delta Company in May 1968. He is now the company's senior field artillery repairman. When a third brother, Specialist 4 Timothy R. Fosdick, 22, was assigned to 1st Battalion, 27th Infantry in mid-October 1969, SSgt. Fosdick and Sp 5 Fosdick both agreed to extend for six more months if Sp 4 Fosdick was assigned to their company. Now there is a rumor that when Delta Company holds reveille in the morning now, there is one extra platoon that needs to be taken into account - The Fosdick Platoon. They are called everything from "The Fearless Fosdicks" to "The Three Stooges." "Each person in the company seems to have a different nickname for us," said Sp 4 Fosdick. THE FOSDICKS' being stationed together has caused confusion for other people. Once they went to the PX together, where they showed their I.D. cards to the girl at the door one after another. The girl thought that they were carrying forged I.D. cards because they all had the same last names. In all, SSgt. Fosdick has extended for duty in Delta Company four times, and Sp 5 Fosdick has extended twice. "I can never seem to be able to leave this place." commented SSgt. Fosdick wistfully. "Every time I get ready to leave - in pops another brother." NEW REGULAR CO. Lieutenant Colonel Warren A. Jones of Minneapolis has succeeded Lieutenant Colonel Jefferson K. Rogers of Aurora, Colo., as commander of the 3d Battalion, 22d Infantry. Rogers has moved to the Qui Nhon support command. 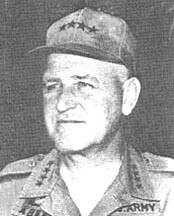 Jones was formerly executive officer of Tropic Lightning's 3d Brigade. CH-47 Chinooks brought the troops to the top of the mountain. Sounds of machetes slashing through thick underbrush were interrupted by frequent blasts from exploding grenades. American and Vietnamese soldiers were making their way across giant boulders and jungle down the northern slope of Nui Ba Den. 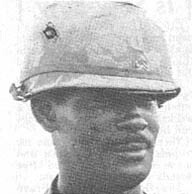 "Operation Cliffdweller," a multi-battalion endeavor under the operational control of the 3d Battalion, 22d Infantry's commanding officer, Lieutenant Colonel Warren Jones of Minneapolis, had as its purpose the clearing of hundreds of caves and holes on the mountain's north side. Forty enemy died in the three-day journey down the mountain. The entire operation consisted of establishing blocking positions, sweep forces and ambushes around the mountain. 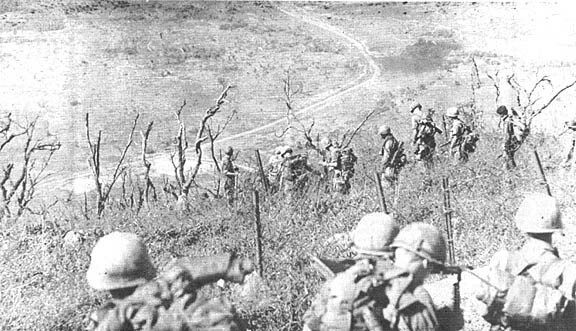 Charlie Company of the Regulars took on the task of descending the mountain from the top, driving out enemy elements and destroying their positions. The Regulars were accompanied on the descent by provincial reconnaissance unit (PRU) soldiers. The combined force started from the Tropic Lightning signal facility on the mountain top. 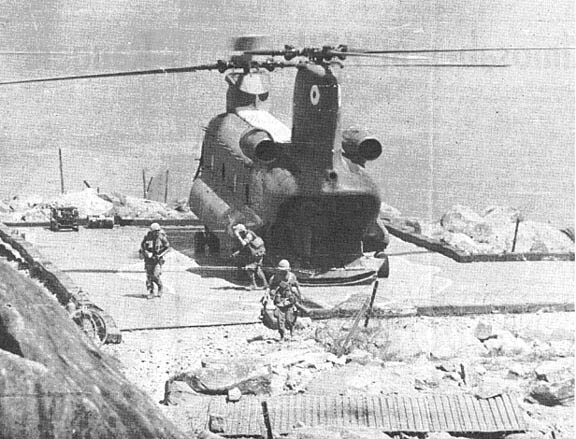 CH-47 Chinook helicopters carried the troopers to the top and from there they started their downward journey. The force made its way through vines, jagged boulders, steep cliffs, and recently dropped riot control agent. The Regulars worked through areas that at first glance appeared impassable. It was never a choice between the easiest ways down, but rather between the best of the bad. For three days they fought a dual foe, the unseen enemy fleeing before them and the vertical jungle with rocks that is the side of Nui Ba Den. The elite point element of Charlie Company preceded the rest down the slope, blowing as many caves and holes as they could. Other units involved in. 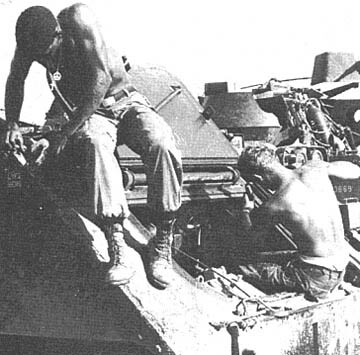 Operation Cliffdweller included Alfa Company, 2d Battalion, 34th Armor; Bravo Company, 4th Battalion (Mechanized), 23d Infantry; 160th Regional Forces Company; and the Tay Ninh Province Reconnaissance Unit (PRU). The Black Virgin Mountain fought the Regulars just as hard as Charlie did, but the combined force proved itself capable of handling both battles. 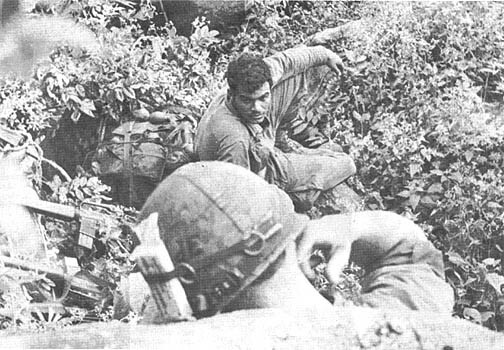 'Operation Cliff dweller' begins as Regulars, Vietnamese start down Nui Ba Den. LARGE ROCKS, dead trees and underbrush surround the Regulars during their three-day trip down Nui Ba Den. Specialist 4 Jack Thomas, an RTO for Charlie Company's forward observer, grasps a tree trunk for support. Specialist 4 Bruce Hahn enjoys a brief, 45-degree snooze during a break. 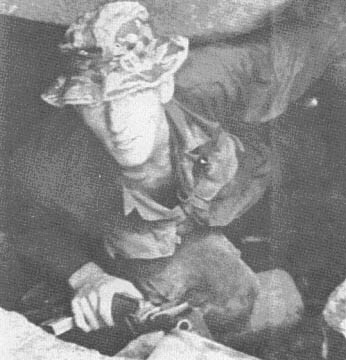 Sgt Larry Goethe emerges after exploring a cave. CHARLIE Company commander Captain Norman Sligar has a look of knowing anticipation as he prepares to slide down a big rock. There were plenty of fatigue pants to DX after the operation. A machete blazes a trail. FIRE IN THE HOLE! 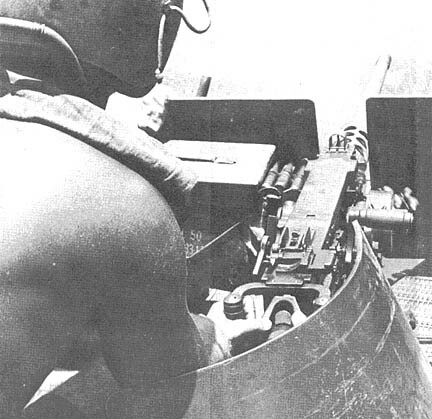 With his grenade pin pulled and ready to drop, Private First Class John Larsen prepares to blow one of the deep holes too small to get into and investigate. Each day of the operation, the quiet of the mountain was pierced by explosions as members of the point squad had a grenade for each cave and hole they found. Gear had to be handed down over giant rocks during the three-day trip down the mountain. CU CHI - Moving more than 150 tons of supplies, which is about the same thing as transporting about 300 circus elephants, is a big job for the men who supply the Golden Dragons of the 2d Battalion, 14th Infantry. Finding room to send along some luxury items such as ice cream, cold beer and fresh clothing makes the task doubly difficult. SOMETIMES these precious commodities do get left behind for absolute essentials like food and ammunition. However, eventually they do get to the men who eagerly await them. Captain Robert Scheifele of Columbus, Ga. is the man responsible for seeing that the goodies get through as well as the necessities. "Problems often arise in getting these items out to the field when a company is in a location where they can be delivered only by air. But if we don't make it one day, we'll make it the next," Scheifele said. "We fly about 224,000 pounds of supplies a week. Also part of the battalion's supply tonnage goes by truck. Three trucks a day haul a weekly 42 tons to Fire Support Base Patton II and nearby posts," Scheifele explained. "Its a big job, and an important one." DESPITE THE difficulties often posed by logistics problems, even the remote patrol bases frequently have ice cream to serve for desert. The men have fresh sets of clean clothes everyday, which makes taking a shower worthwhile, and two hot meals are served everyday as well. A PX conex is brought to the Fire Support Base once a week to supplement the sundry packs the men receive. The 25th Supply and Transport Battalion has earned a fourth oak leaf cluster for its Meritorious Unit Commendation. Battalion Commander Lieutenant Colonel William R. Strong accepted the award recently in ceremonies at Cu Chi. The unit was cited for "demonstrating extraordinary fortitude, determination and professional competence ... despite adverse working conditions and constant enemy harassment." CU CHI - The Commanding General's monthly Logistic Readiness Award was recently awarded to the 25th Aviation Battalion. The award was presented to Lieutenant Colonel Robert R. Gosney, Commanding Officer of 25th Aviation, by Division Commander Major General Harris Hollis. Competition for the award includes all division battalion-size units. In this competition the 25th Aviation Battalion accumulated a total of 92.1 points out of a maximum 100. Units are inspected by the divisions CMMI team, which covers such areas as: equipment serviceability, prescribed load list and maintenance management. TAY NINH - They may be "only" medics, maintenance personnel and cooks, but the men of the 4th Battalion (Mechanized), 23d Infantry's Delta Company, like all infantry support troops, play a vital role. Captain Jesus T. Perry of Sunny Vale, Calif., Delta Company executive officer, puts it this way: "Although our platoons are independent of one another, we are one company with one purpose, and that is supporting our line companies in the field." IN ADDITION to maintaining operations in Tay Ninh base camp, each section has personnel and facilities at the battalion's fire support bases. The line companies need mechanics on most operations to keep their APCs in top running condition. They need cooks to provide the hot meals in the field that look so good to a trooper who's been leaning against a tree or a track eating C-rations most of the week. They need medics. "THERE IS at least one medic per platoon in each of the line companies," according to Sergeant First Class Willie White, a section sergeant. "They are assigned to Delta Company and I assign them to a company in need of a medic." The cooks and mechanics are likewise distributed throughout the battalion's operations area, making sure that the Tomahawk infantrymen have what they need. 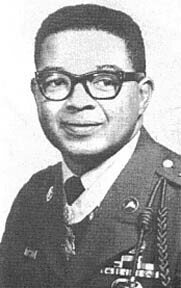 SPECIALIST 6 Lawrence Joel, a combat medic, won the Medal of Honor while serving with the 173d Airborne Brigade on his first Vietnam tour in 1966. Joel won the highest honor when he treated dozens of wounded men during a 24-hour battle despite two wounds he had received in his legs. Joel is joining Tropic Lightning this month for his second Vietnam tour. DEAR SARGE: I recently purchased a complete stereo sound system and set it up in my bunker 12 feet under Tay Ninh base camp. During rocket attacks my bunkers becomes flooded with moochers who drop in to groove on my woofers and tweeters until the attack is over. Don't you think they ought to dig their own bunker and get their own sound system? DEAR SAN: There are many ways to discourage people from bothering you. You could put a sign outside your bunker saying, "All Volunteer KPs report here." You could make a rule that nobody who isn't at least an E-6 and older than 21 can come in. Or, you could buy some special bunker-clearing tapes to play in emergencies. We would recommend anything by Guy Lombardo, Snooky Lanson, Shelley Fabares or Stan Wolowic and his Polka Chips. Finally, as a last resort, you could turn your set up as loud as it will go, and woof and tweet the intruders all the way to Nui Ba Den. DEAR SC: I am a member of a scout dog platoon. My dog Charybdis and I have been together for nearly a year, working together, playing together, eating ham and lima beans together. We have decided we want to be married. I have taken this matter through the chain of command, but so far with only indifferent results. My squad leader says it's okay with him as long as I don't miss any bunker guard. My first sergeant, however, says he can't find anything in the ARs allowing it. Since he couldn't find anything in the ARs forbidding it, either, though, he sent me to the CO, who told me it was okay with him as long as I don't miss any bunker guard. The chaplain warned me about the problems of mixed marriages and told me to "think very carefully before you do anything that might affect your future." The finance office says they don't care as long as I give them an address to send my allotment checks. My father wrote to ask who would pay for the booze at the wedding reception. All of this has me confused. What should I do? Dear Dog: It's true that you may have some problems, such as finding suitable housing when you get back to the World. Also, you should be warned that if Charbydis needs medical care, Army veterinary facilities are usually booked up eight or nine years in in advance. However, there is no reason why your relationship can't be a happy one. You might even get in the Tropic Lightning News. Rome plow blades push back the brush in the Boi Loi Woods. TAY NINH - Suspected enemy-infested jungles of the Boi Loi Woods are being rome-plowed, exposing the pock marks of numerous engagements and the remains of many enemy bunkers and fighting positions. Rome plows from the 62d Engineer Battalion at Long Binh are being secured by men of the 2d Battalion (Mechanized), 22d Infantry as the engineers plow the jungle. From a night laager in the Boi Loi Woods itself, the plows move out early and cut about 200 acres daily. The plowing operations unearth old enemy positions and trails, thus reducing future infestation by the enemy. Plowing also makes the job of patrolling the woods easier. So far, numerous bunkers, trails and fighting positions have been exposed. 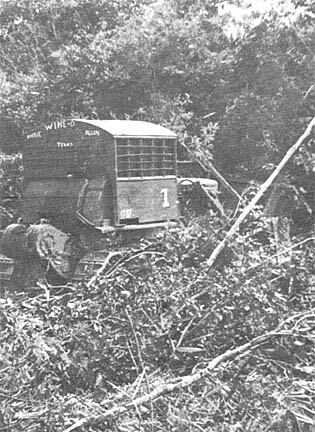 Specialist 4 Walter B. Owen of Glenpool, Okla., a rome-plow driver, said, "There' aren't as many big trees here as on other operations I've been on, but the bamboo and underbrush is thicker." Private First Class Jerry J. Harder, Bravo Company track driver, said, "It sure is easier to drive through with the rome plow than try and fight the brush to make a path." The big blades cut through even thickest brush. The big plows eat their way into the woods. Triple Deuce APCs provide security for the engineers. The day almost over, a column of plows heads back to a night laager site. 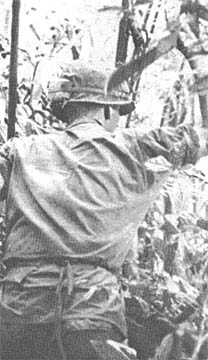 CU CHI - Infantrymen are making a deadly habit of springing ambushes on Charlie in Delta Company, 2d Battalion, 12th Infantry. Most recently it was the Warriors of 3d Platooon. Led by platoon leader Second Lieutenant Lawrence W. Payne of Coalinga, Calif., Delta's 3d Platoon moved south from Patrol Base Lorence, putting out their claymore mines and getting settled for an all-night vigil about 1500 meters southwest of the Fire Brigade base. Shortly after midnight, seven to eight individuals were spotted moving in a southerly direction. "When they came within range of our claymores, we opened fire," said Private First Class Dan Sargent of Boise, Ida. Sweeping the area, the Warriors found four enemy bodies and several blood trails. A few days earlier, the men of the 1st Platoon of Delta Company stole the show by amassing a body count of 19 and a hoi chanh who rallied to the Republic of Vietnam. Their ambush was set up to the north of Fire Support Base Pershing, not far from highway 6A. CU CHI - Delta Troop, 3d Squadron, 4th Cavalry recently proved again what a fast working, closely coordinated airmobile unit can do. Using the combined efforts of a Delta Troop OH-6A light observation helicopter and its own aero-rifle platoon, a Delta Troop "checkmate" mission accounted for five enemy soldiers killed, four detainees, two AK-47 rifles, two nine millimeter pistols, one large Chicom antipersonnel mine, several fragmentation grenades, and large quantities of medical supplies. Captain Wayne White, Delta Troop's aero-rifle platoon leader, said, "In a checkmate mission my men are dropped into an area marked by the LOH and then check out possible enemy positions. 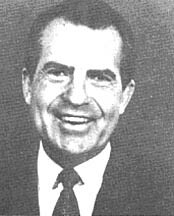 If we encounter any Vietnamese personnel we carefully check them out for identification." "During the last two days, our checkmate missions have been extremely profitable," continued White. "We've been able to pinpoint Charlie's location because he was anxious to shoot at one of our low flying light observation helicopters. The LOH finds the enemy and then we flush him out." CU CHI - Warrant Officer Gene Trask of Middleton, Mass., Little Bears' pilot of the 2d Brigade's command-and-control ship, was flying at an altitude of 600 feet a mile west of Cu Chi recently when things started going wrong. "We were near the rubber plantation almost over the contact area. Suddenly there was a terrific jolt. The gears were tightening. I heard a very loud high-pitched grinding sound. Then the master caution light flashed on," Trask said. THE HYDRAULIC line had been cut. Without hydraulic fluid the controls used to steer the chopper were almost impossible to move. The collective, pedals, and cyclic which regulate up and down, right and left and hover movements could be operated only with a great deal of pushing and pulling. "I was a bit shaken at first," Trask said. "Then I settled down. I went through the standard emergency procedure. I checked my instruments to find out what the problem was. I called Cu Chi tower. Crash trucks were sent out to the landing strip. Trask decided that a slow, very shallow or low angle of approach would be best. This would require the least amount of maneuvering. Two feet off the runway the collective would no longer move. The chopper landed with a single bounce. Trask shut down, got out and breathed a sigh of relief. WARRANT OFFICER Gary Thompson of Hatch, N. M., co-pilot of the Fire Brigade's C-and-C ship, said "Once Gene realized what was happening he calmed down and just 'greased' the chopper on in." Captain Carl Savatiel of Louisville, Ky., 2d Brigade artillery liaison officer, who was aboard the ship at the time, said, "I sure didn't want to go down in the place where we were. I was sure happy we had a good pilot to get us back safely." Remember the post-Tet offensive? Mole City? The Diamonds? Frontier City? Crook? Tay Ninh City? The 1969 Tropic Lightning Yearbook, a 220-page pictorial history of the 25th Infantry Division's fourth year in Vietnam, can now be ordered through unit Tropic Lightning Association representatives. Price is $5. Eighty pages will be in color. Each division unit will be featured in a section of its own. Delivery is expected in February and the book can be mailed directly from the publisher anywhere in the world.